We received the Exploring Creation Field Trip Journal from Apologia Educational Ministries to review. Apologia is a Christian, family-owned homeschooling company that creates exceptional curriculum and educational, learning products. This product is a journal and memory book all in one. And it's styled like a scrapbook. We love the design and it's very colorful and artistic! 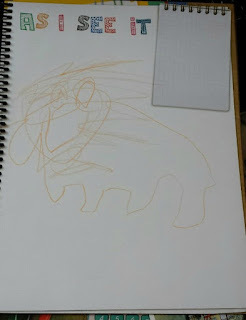 - As I See It drawing pages in the back of the book to explore movement, reflections and shadows, patterns, textures and colors, predators and prey, and many more to create your own! 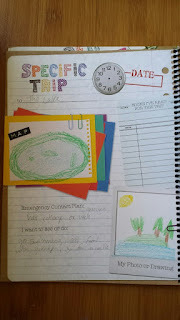 We have taken three trips so far with our Field Trip Journal and one imaginary trip, which was inspired by a book about dreams, and the kids talked about where their perfect trip would take them. For Munchkin it was Africa and for Bean it was Asia. We're saving the rest of the journal for our planned field trips this summer. Bean primarily used this journal to record trips and nature walks. We wrote down where we went and who we went with or were planning to see. We also wrote down where to go if there was an emergency. Bean drew pictures of the lake, and the island. On the following page, I let her write for herself. She talked about going on walks, going swimming, taking boat rides and eating food with her grandparents. We decided to add "I want to visit and see..." pages about places they dream about visiting. Munchkin wants to go to Africa to see all the safari animals, including lions, which he drew a picture of using the As I See It page. He's 3 and usually prefers to draw cars, robots and monsters, so this book has provided a nice treat for him to draw animals and buildings. We loved using our Field Trip Journal. We'll be taking it with us this summer on our annual trip to the Boston Aquarium and one of our local zoos (we haven't decided yet which one we want to visit). We also have plans to visit a handful of museums and exhibits, such as the Lowell Mills and Textiles Museum, Boston Museum of Science, and the Science and Discovery Center. It's perfect for field trips because it's compact, has a spiral binding (which makes it so much easier to write on and keep open) and has plenty of space for many adventures (10, in fact). I'd say it's best for children 6 or older, children who are more familiar with writing. If you're planning on sharing it between your children, I'd suggest marking which pages are theirs to use. I have to do this with my two, otherwise there is occasionally an overlap and Bean is incredibly picky about her space. 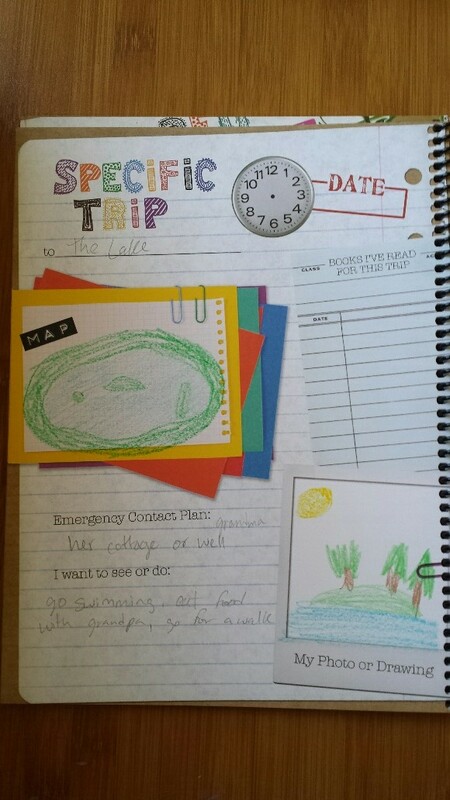 If you have multiple children and you know you'll be going on many field trips, it may be better to purchase individual Field Trip Journals for them. Here is another review from Apologia we have written iWitness Biblical Archaeology, New Testament iWitness, and Old Testament iWitness. Be sure to check out more reviews from the TOS Crew by clicking the banner below!